This companion post provides information on 11 reports released by NGOs, international agencies, and research centers. 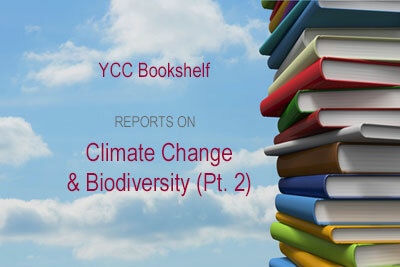 The October 12 companion post highlighted 12 books that provide overviews of likely impacts of climate change on biodiversity, historical and species-specific case studies, surveys of habitats and ecosystems, and reflections on places, policies, and practices. This post highlights reports on climate change and biodiversity released by environmental organizations, international agencies, and research centers. We present these reports in chronological order; as always, the descriptions are drawn from copy provided by the publishers. The Polar Bear has come to symbolize the impacts of climate change on the natural world. But it is only one of a multitude of species affected, and many of these are also well-known, much-loved and important to people. This report presents 10 new climate change flagship species, chosen to represent the impact that climate change is likely to have on land and in our oceans and rivers. Arctic Biodiversity Assessment 2013: Synthesis is a stand-alone document summarizing the characteristics of Arctic biodiversity, human use of wildlife over time, status and trends in Arctic biodiversity, stressors and their alleviation, knowledge gaps and suggested conservation and research priorities. This report brings together a broad range of new and existing information on 2,358 plant and animal species of the Albertine Rift (AR) region of East and Central Africa. A collaborative project assessed the climate change vulnerability of all known Albertine Rift mammals, birds, reptiles, amphibians and fish, as well as a range of plants, whilst simultaneously gathering detailed information on their use by humans. These results have been combined with Red List assessments of species extinction risk due to non-climate change driven threats, where available. Overall, this study presents the results of perhaps the most holistic assessment to date of the status of, threats to, and use by humans of the region’s biota. In 2012, US AID missions launched 11 activities receiving both biodiversity conservation and global climate change adaptation funding. This brief describes lessons learned from integrating these activities in order to create best practices for future programming. Integration can amplify an activity’s impact and sustainability when done appropriately. However, it can also conflict with the intended goals of adaptation and biodiversity programming when done poorly. The brief recommends using some version of systems analysis to identify intersections where vulnerable ecosystem services have a large impact on human well-being and where biodiversity and people rely on a shared vulnerable resource may serve as good areas for integration. States along the Eastern Seaboard are already feeling the impacts of climate change. Communities across the region, both natural and human, depend on coastal beaches, bays, and islands for a wide array of benefits. These unique ecosystems provide crucial habitat for wildlife such as fish and waterfowl and support robust tourism and recreation economies. They also serve as natural buffers against potentially damaging storms and, increasingly, against rising sea levels. As the risks from sea-level rise continue to grow, so, too, has the impetus for states and communities to prepare for changes that are occurring by taking actions to improve coastal resilience. In the wake of increasingly dire projections for sea-level rise, however, it is equally essential that we prevent the worst outcomes by significantly reducing the nation’s greenhouse gas emissions. The world’s climate is changing rapidly and protected areas are an increasingly important component of national and international climate change adaptation strategies. These guidelines articulate essential elements for adaptation planning and implementation, and it describes additional resources that site managers can use right away. In coastal environments, climate change impacts can be especially acute and often affect people’s livelihoods. Therefore, knowing how to adapt to changes before they happen is of paramount importance. Ecosystem-based adaptation (EBA) employs conservation, sustainable management and/or restoration of ecosystems to adapt to the adverse effects of climate change. The guide is a strategic resource aimed at environmental and adaptation managers and planners in government departments and agencies and in businesses and civil society organizations. It explains the principles and concepts of coastal EBA, presents a range of different coastal EBA options, and discusses the challenges that must be addressed in implementing EBA. The Protected Planet Report 2016 assesses how protected areas contribute to achieving the Aichi Biodiversity Targets and relevant targets of the Sustainable Development Goals, and highlights current research and case studies as examples of the role protected areas play in conserving biodiversity and cultural heritage. This State of the Arctic Marine Biodiversity Report (SAMBR) is the first integrated reporting outcome from the Circumpolar Biodiversity Monitoring Program (CBMP). The Arctic Biodiversity Assessment (ABA) (Meltofte 2013) provides the fundamental baseline to make trend assessments in SAMBR possible. Six Marine Expert Networks (Sea ice biota, Plankton, Benthos, Fishes, Seabirds and Marine mammals) provide the framework to implement the CBMP Marine Plan and generate the information required for SAMBR. This is the second State of the Salmonids (SOS) report, the first of which was published in 2008. At the writing of the 2017 report, the commercial salmon fishery is again closed for the season. The northern part of the state is emerging from historic drought (2012-2016), which saw significant negative impacts on salmonid populations and juvenile survival. New information is helping to paint a clearer picture of the true plight of California’s salmonid populations. While California’s climate, precipitation patterns, and trends in salmonids has changed, monitoring efforts, especially for species not listed under the Endangered Species Act, remain insufficient. *For a rich description of the New World before Columbus’ voyages, and for a detailed description and explanation of what happened afterwards, see Charles Mann’s historical duology, 1491 and 1493.